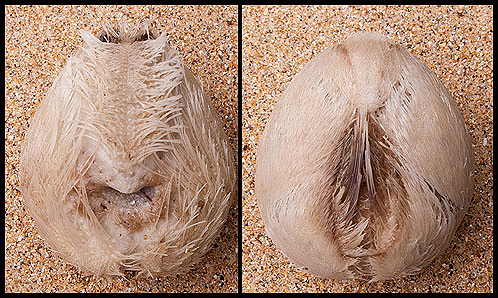 Views of the Underside and Topside of a Dead Sea Potato , with it's spines still attached , the head end is at the bottom of the photos. Also known as the 'Heart Urchin' due to its distinctive shape. This medium-sized burrowing sea-urchin is densely covered in fine spines , yellow-brown in colour, giving it a hairy appearance. The Sea Potato lives buried in up to 15cm of muddy and sandy sediments from the shore to 200 metres deep. The familiar, spine-less, pale brown 'test' (shell) of the dead animal is often washed up on the shore resembles a potato, hence the common name. The sea potato burrows in the sand. Special spoon-shaped spines on the urchin’s underside help it to dig, while longer spines on its back allow water to funnel down into its burrow to be used for respiration.